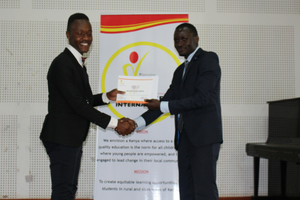 Collins Kibugi, an alumni of Muhoho High School and The Family Group Foundation Scholarship Program, joined Promoting Access to Community Education program (PACE) earlier this year as a fellow. 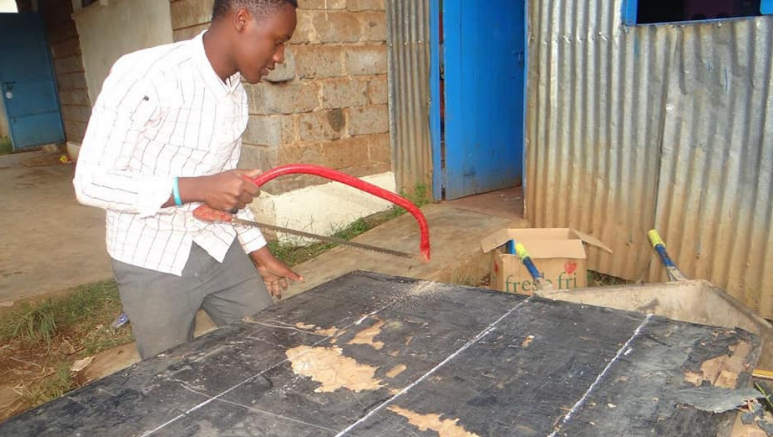 He was assigned Njathaini Primary School as a teaching assistant. 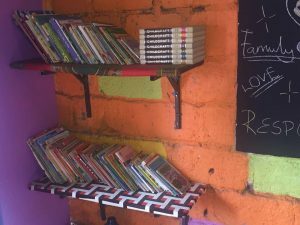 Thanks to their initiative, Njathaini Primary School in Kasarani Constituency now has a library. 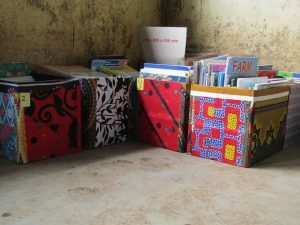 “When we began this project we didn’t have a full school library in mind, but somewhere we could place the scattered books and make it easier for the children to pick books. We started the project. 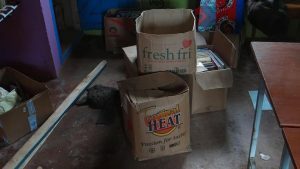 The shelves would be made from cartons which we obtained from Gikomba and then held by metallic bars which we got from a jua kali nearby. As we went on we realized the other side required more stability. The cartons were only stable in short lengths and the other side of the room was made of wood unlike the other side which was a stone wall. We came across an old discarded board that we cut to smaller pieces and then painted with blackboard paint, it was the only one available. We covered the cartons with Ankara for decoration. After posting the metal bars which acted as holders we placed the cartons and smaller pieces of the board, we then placed the books we had on top. When we showcased this to the head teacher she was amazed and told us that there were more books in her office, we picked them immediately and sorted them in the library in upper, lower, newspaper corner, encyclopedias and textbooks. We then labelled the library with Ankara print.